Lesson from LDS Church History Primary Manual: 600 People died in the winter of 1846, but many were healed through fasting and prayer. I don't even know how to comment on this. If it wasn't so tragic, the paragraph would feel like a joke. 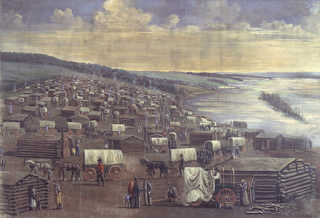 Background story: In 1846, as the Mormons were fleeing Illinois after the murder of the Prophet Joseph Smith, around 8000 pioneers spent the winter near what is now Omaha, Nebraska. Malaria, bitter cold and starvation killed more that 600 people. .... when you are starving, does that count as fasting to God? Or does it only count when you have food in the fridge and you choose to not eat?